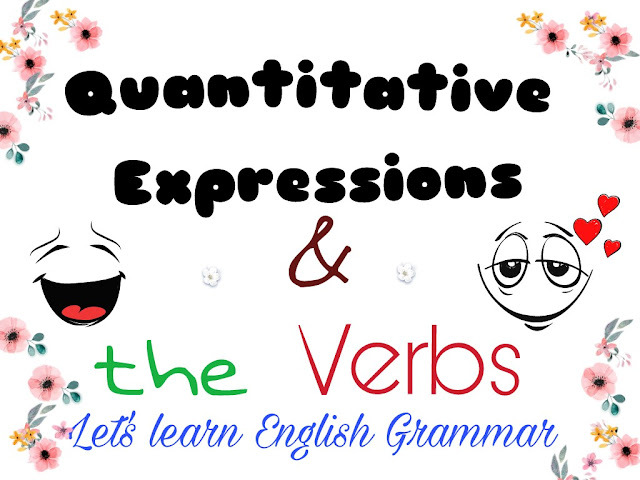 We have learnt what is Numeral Expressions and the Verb in the previous lesson, and now, here we have Quantitative Expressions And The Verbs. We shall begin with Rule 22. Rule 22 —Indefinite Quantity/Definite Quantity. Much of milk has turned sour. Plenty of tea has gone waste. A lot of butter has been purchased. A good deal of food was found to be tasteless. In the same way, some other expressions showing Indefinite/Definite Quantity are – a lot of, lots of, heap of, plenty of, half of, a quarter of, some of, much of, most of, part of, all of, rest of, a great deal of. Some expressions given above in Rule 22 and under Rule 21 in the previous lesson can express both Number and Quantity. If the noun used after ‘of’ in these expressions is countable, it would show Number; if it is uncountable, it would show Quantity. A Plural Verb is used with countable nouns, and a Singular Verb with uncountable nouns. Rule 23 — Many a/an + Singular Noun, More than one. Many a boy is absent today. Many a ship is lost in the ocean. Many an opportunity is missed by negligence. More than one chance was given to him. The above noted expressions can be changed and formed thus also – More boys than one, More opportunities than one, More chances than one. The Subject in all these expressions is Plural, therefore, they require a Plural Verb. Rule 24 — Singular Collective Noun + of + Plural Noun. A team of players is staying here. A garland of flowers is ready. A batch of students is studying here. A bunch of grapes has fallen from the creeper. Some other singular collective nouns are – a chain of, a garland of, a bunch of, a series of, a herd of, a flock of, a band of, a set of, a bouquet of, a galaxy of, a fleet of, a pair of, a gang of, etc. Rule 25 — Hyphenated Expressions/Singular Noun repeated after a Preposition. There are some expressions in which the same Singular Noun is repeated after a certain Preposition. As – wave after wave, ship after ship, brick upon brick, row upon row. With all such expressions Singular Verb is used. Ship after ship arrives here. Brick upon brick is laid. Shot after shot was heard. My great hope is my sons. Here the greatest danger is the snakes. The conditions are as follows. The details of the case are as follows. The account of expenditure is as follows. The main points are as follows. Not only the teacher but all his students were injured. Not only I but all my brothers are worried about him. Not only his sons but he himself is a great artist. Not only they but you are also to blame. Rule 29 — Nothing but + Noun Singular/Plural. Nothing but blue water was seen. Nothing but smoke was there. Nothing but ceaseless toil was his lot. Nothing but hills is seen there. Rule 30 — There is/There are. There is a book on the table. There are some books on the table. There is a chair in the room. In the sentences given above, in sentences at No. 1 and 4 the Nouns book and chair are Singular, therefore the verb is singular (is); in sentences at No. 2 and 3, the Nouns, books and chairs are Plural, therefore the verb is also Plural (are).